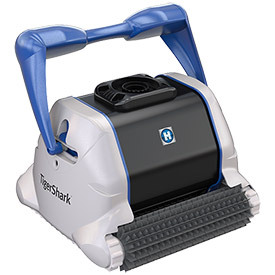 Flamingo Pool Supply, in Frederick, MD, is proud to offer Hayward TigerShark® automatic pool cleaners. New for 2016, our TigerShark® series of robotic cleaners feature a new and contemporary design. Equipped with intelligent microprocessor-based technology, the TigerShark family is recognized for its superior performance in reliability and efficiency. TigerShark makes sure virtually every area of your pool gets that much cleaner, and fast! The TigerShark QC automatic robotic cleaner is no exception with a fast 90-minute Quick Clean cycle.